Reported to be one of the most exciting new bands to emerge this year, post punk inspired guitar band Savages have just released their live EP ‘I Am Here’. Seeming to take inspiration from the dark intensity of Joy Division and Siouxsie and the Banshees, the band appear to be most at home in a live environment, if reports are anything to go by. I missed their session for Marc Riley’s 6music show earlier this year, but listeners were still talking excitedly about it throughout the week, and judging by the high standard of sessions on this show, that suggests they were on form. The ‘I Am Here’ EP “was recorded on the band’s July UK tour on dates in tiny, heaving clubs in Bristol and Nottingham. The recordings capture the full scything energy and brutal power of the Savages live experience” according to the bands press release. The four tracks are ‘City’s Full’, ‘Give me a gun’, ‘I am here’ and ‘Husbands’. 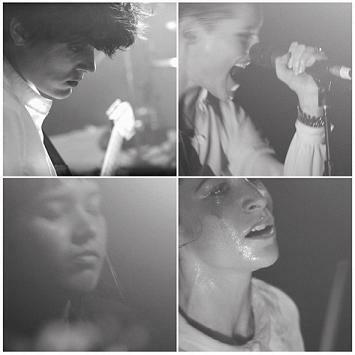 Savages are Jehnny Beth (vocals), Ayse Hassan (bass), Fay Milton (drums) and Gemma Thompson (guitar). They expect to start work on their debut album soon. On the subject of new musicians, Californian Singer/Songwriter Chelsea Wolfe releases her debut album in November. I have been late to discover Chelsea but feel she has something of the gothic folky about her, she comes across as someone who would be equally at home singing murder ballads and folk music as blues, as the track ‘Mer’ shows. I look forward to hearing more from her when the album comes out. Tilly and the Wall also have an album out in November, and this song, ‘Defenders’ features their unique percussive technique married to the kind of fierce tribal pop currently being championed and explored by Gaggle. I’ve been intrigued by Tilly and the Wall ever since I found out that their chief percussion instrument is a tap dancer called Jamie, but this song feels like something of a departure for the band, so it’ll be interesting to hear the album when it comes out. Image is of the band Savages performing live. It is actually a grid made up of the four members of the band performing live. Image provided by Technique Publicity. Video one: This is a promo video advertising the Savages live EP. It is made up of black and white footage of the band performing. Towards the end of the trailer the screen turns black and the following words appear, slowly, on the screen: “I am here. No more fear. No more dark shadows. Let it come. Let me talk to you. See the face of your future. I don’t wanna hide. Hear it calling you.” There then follows the record sleeve image, and the release date: 30/9/12. Video two: Chelsea sings amidst forbidding rocks amongst the sea and dark rooms smoking with dribbly candles. Everyone is wearing black. There seems to be some kind of seance or ritual going on. There’s also a room of blindfolded people, women dancing in a circle around a fire on the beach, and snakes. Video three: Tilly and the Wall, Defenders: The band perform with various children and young women in a rocky wilderness. Warpaint has been deployed to create smears and shapes on the skin, and the clothes range from a sort of couture tribal look circa the mid 80s to scruffy sacking. The participants are dancing, singing and running. Everyone appears to go through a primitive doorway, vanish and end up in a toy room at the end. I think.